1. 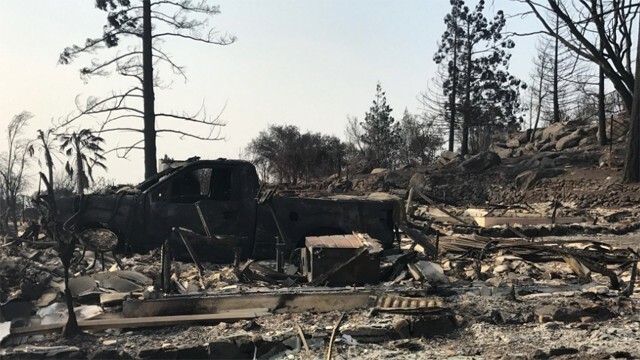 Firefighters are starting to make some headway with the largest of the deadly North Bay blazes, gaining 10 percent containment on the Tubbs Fire, which ravaged Santa Rosa earlier this week, and 3 percent containment on the Atlas Fire in Napa, reports Lisa Fernandez of KTVU. The death toll from 22 Northern California fires this week has reached 24, and the number of missing people is still more than 200. 2. Oakland’s air quality, because of thick smoke from the North Bay fires, is the second worst in the nation, behind only Napa, the San Francisco Chronicle reports. According to the Environmental Protection Agency, Oakland’s air is “unhealthy” to breathe, registering a 161 on the index gauge, behind Napa’s 167. San Francisco and San Rafael registered at 155 and Livermore at 145. The Bay Area Air Quality Management District predicted that air pollution will worsen in the region on Friday and Saturday. 3. Schools throughout the East Bay closed today — although not Oakland schools — because of the smoky air, including West Contra Costa schools, reports Eric Ting of SFGate.com. In addition, the Pittsburg Unified, Martinez Unified, Mount Diablo Unified, and Antioch Unified school districts closed today. Oakland canceled PE and other outdoor activities and allowed students to stay home without being considered absent. 4. The Alameda school board is calling on the city to ban new cannabis facilities from opening within 1,000 feet of schools, reports Peter Hegarty of the East Bay Times$. The sale of marijuana for adult recreational use becomes legal in California on Jan. 1, and the city of Alameda is planning on permitting cannabis dispensaries on the Island. 5. Alameda Encinal High School teacher Kevin Gorham and Oakland Unified special education teacher Stephanie Taymuree have been named co-teachers of the year in Alameda County, reports Peter Hegarty of the East Bay Times$. Gorham, who teaches AP government and economics, is known for leading the student-run radio station at Encinal. 6. And President Trump signed an executive order today that will allow insurance companies to sell health plans that do not protect people with pre-existing medical conditions — a move that health policy experts say will undermine Obamacare and drive up prices for sick people, The New York Times$ reports.